Su Dongpo, also known as Su Shi, was one of the greatest calligraphers and poets of the Northern Song (960-1127) dynasty. Ren Zhenhan here depicts him in the image of his own poem - carrying a stick, dressed in hermit's clothes - and in the specific brushwork style termed by Su Shi when describing the calligraphy of his contemporary Huang Tingjian (1045-1105) as "snake hanging from a tree". The painting is dated 1989, the year of the snake. Ren favoured literary subjects for his figure paintings; this scroll may be compared with Shanghai School of figures of the 19th century. Su Dongpo (1037-1101), also known as Su Shi, was one of the greatest calligraphers and poets of the Northern Song dynasty. 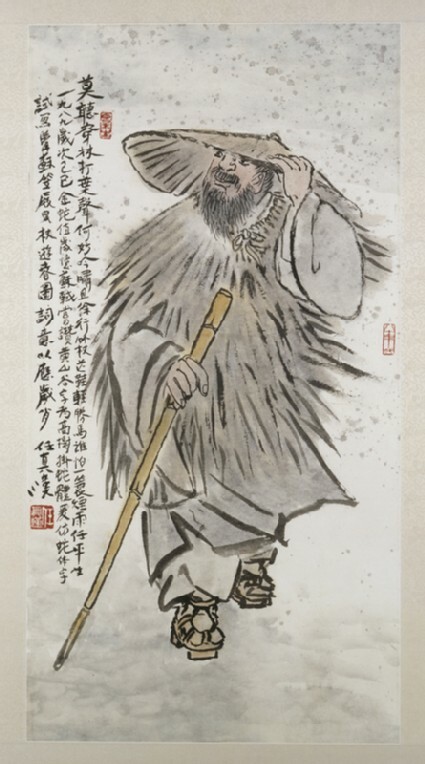 Ren Zhenhan depicts him as a character from one of his own poems, carrying a stick, dressed in hermit’s clothes. 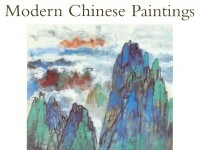 He also uses a specific brushwork style, noted by Su Dongpo when describing the calligraphy of his contemporary Huang Tingjian (1045-1105), of a ‘snake hanging from a tree’. The work was in fact painted in the year of the snake. Ren favoured literary subjects for his figure paintings, and this work may be compared with other Shanghai School figures of the 19th century.